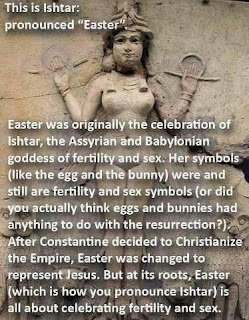 Ruminations: Reality Check: Is Easter a Hijacked Pagan Holiday? You seems to be confused about religion and human concept. Pagan system was deep rooted into life and living in a natural way. Christianity/judaism /Islam etc all are fabricated and well conceived by authoritative human. Concept of god was evolved to deny answering for uncomfortable questions. Conclusion: claims by pagan or any other old culture are always partly true as minimum. There are older concepts of humanity comming from Indian subcontinent like Hinduism, budhaism, Jainism. Adjacent to that Zoroastrianism. Wonder . You would do well to actually read the material before you without preconception. It is a historical commentary that has nothing to do with the nature and concept of God.